Another caveat: this was actually not Anne’s recipe but a recipe she found online and has placed in her repertoire and has now become a part of mine. This recipe has not failed me and has in fact been the most useful recipe I’ve learned in the last year. If anything, this recipe only gets better with every tweak granted that the base is covered. By that I mean I you have the right amount of meat for the marinade. Anyway, enough prattling. On to the killer marinade! 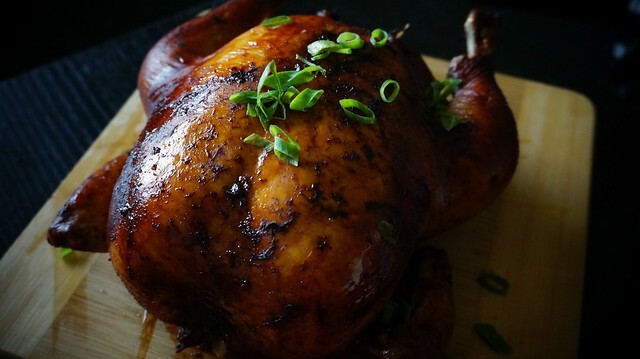 This awesome Chinese roast chicken recipe will never bring dishonor to your ancestors, your cows, and your family table. Put everything in a bowl and forget about it until you need to use it for the roast. 1. Bathe and massage the chicken in the marinade for some time and then cover it cling film and put it in the fridge. If you can find a tub/pot where you can submerge the chicken in the marinade, it'll be better. I use a large tub of ice cream for this. 2. Soak the chicken overnight. If you're impatient, 3 hours. The marinade won't fully submerge the chicken so turn it over once in a while. In fact, once is all right. If you want to put a little more love in it, once every one or two hours would be great. 3. 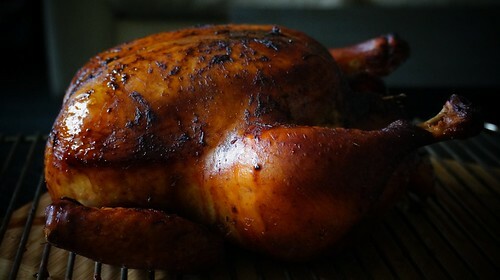 When you're ready to roast, put the chicken out of the fridge for an hour or two until it's room temperature. I usually do this as soon as I wake up. I place it in a cool/sterile part of the kitchen and far from other food stuffs because raw chicken. 6. Roast in 180°C for 45 minutes and then bring it down to 150°C for 15. 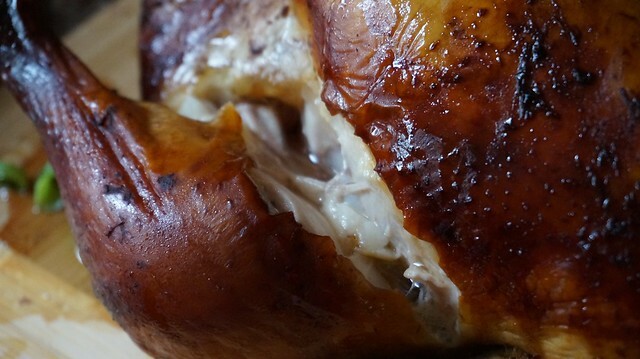 In between the roast, baste your chicken with the leftover marinade. 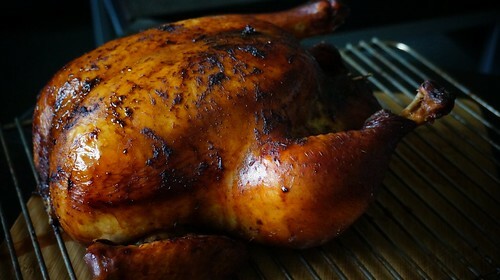 You can also baste with sesame oil towards the last few minutes of your roast to get that nice crisp skin. 7. Your total roast time is around 1 hour. Afterwards, rest the chicken for 15 minutes while covered in foil. 8. Serve it to people you want to enslave for life. 1. Combine the leftover marinade after basting with the roast's juices in the pan and simmer for 10 minutes or until the sauce is thicker and less runny. This makes a good 'gravy' for the chicken. 2. Put it in the fridge until the oil on top hardens. 3. Separate the oil from the jellied marinade at the bottom. Yes. The marinade turns into jelly all thanks to the chicken's collagen! 5. I use the jellied marinade to flavor stir-fries OR as a jelly 'furikake' on top of steaming rice. AWW YISSS. - Boil/steam eggs for 5 minutes and then poke the bottom with a pin and place in cold water then peel. - You can use the cool (but not jellied) leftover marinade from the chicken roast and just dunk them in while the marinade is cooling. Remember to take it out before the marinade becomes jelly. - Serve with your 'furikake' jelly marinade. - Taste the marinade first before making any other adjustments. It should have a good balance of salt and sweetness so when you're making adjustments, try not to stray from that. - If you want to make the marinade for larger chicken or pork (like 2 kilos), adjust by adding a tablespoon more oyster sauce, dark soy sauce, and rice wine and maybe make the chinese four spice to 1 teaspoon. I tend to just make small adjustments but I don't increase my soy sauce and just add a bit of salt instead. - If I want more garlic flavor, 4 cloves will do but I tend to not like this because it kills the sweet balance of the dish. Same with the ginger where I go, at most, 2 tbsp. The marinade is surprisingly versatile and to be honest, I didn’t expect that the marinade would come as close to many of the charsiu I’ve tasted in Japan. It is not, however, the usual roast chicken recipe/duck/pork sold in many Chinese restaurants. I’ve yet to find recipes for that but this one’s actually perfect enough for me that I can’t ask for more. At best, I’ll be experimenting with the kind of soy sauce and Chinese wine I use because I realise that even those make a total difference. The patience required for this dish is worth it. The long marinade makes an entire difference. When I do my ‘braised’ charsiu for this, I try to marinade it before braising as well. For chrissakes, I can go on forever talking about this recipe because it’s so simple and surprisingly perfect and awesome. I’ve actually cooked this for a lot of people and they’re now all part of my harem. My roommate and her boyfriend are the usual customers. My not!husband has tried my first trial of this recipe and he continues to weep when he knows I’m making this roast and he’s not eating it. My friends ate the braised charsiu pork when I made abura soba in Manila and they died and placed it over everything. It’s that awesome. I remember tasting this and crying, ‘WHERE HAS THIS MARINADE BEEN ALL MY LIFE!? !’ I’m so glad it’s finally in my life and I honestly have to thank Anne for telling about this awesome recipe. I can still remember that glorious fried rice I made with the leftover pork. Damn you.